What kind of compensation can I get if I suffered a broken bone in a motorcycle accident? Motorcycles provide no exterior protection and as a result, riders are often thrown from their bikes in the event of an accident. The impact that occurs when a body hits concrete, asphalt, or pavement can be significant and cause numerous injuries, including broken or fractured bones. 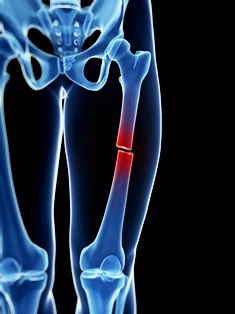 Contrary to popular belief, broken bones are far from minor injuries. They can turn a person's life upside-down, requiring immobilization through splinting or casting, and even surgical procedures. During their recovery period, motorcycle accident victims may be unable to work, which adds financial and emotional stress to an already difficult physical injury. In addition to coverage of current medical bills, a fair settlement or financial award should also include considerations for future treatment related to the injury, such as ongoing physical therapy or rehabilitation. In cases where a defendant's conduct is deemed particularly wanton and egregious, a victim may also be eligible for punitive damages, which is intended to punish the defendant and deter similar conduct from others. A skilled attorney can help you determine if punitive damages might apply in your case. Broken bones can keep you out of work and off your feet while unexpected medical bills fill the mailbox. If you sustained broken bones in a Georgia motorcycle accident, the seasoned attorneys with Van Sant Law can help you fight for compensation. Contact us today to request a free initial consultation. Don't wait—the time to file a lawsuit is limited.